St. George – English Saint or Turkish? We all know the name of St. George, and most of us know he’s the patron saint of England. We know he slew a dragon, and we may remember Shakespeare’s famous line in Henry V: “For Harry, England, and St. George.” And doesn’t it seem fitting that April 23rd, the very day Shakespeare not only was born but also died, is St. George’s Holy Day? But St. George was not English. I knew that and that he actually was from somewhere in the Middle East, but I wasn’t quite clear on where until recently. 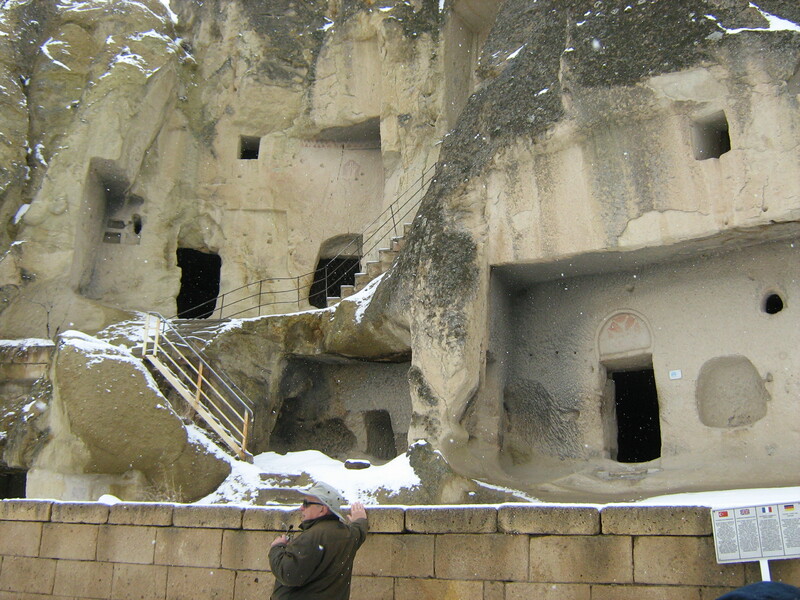 And then in March this year, I visited Turkey and discovered St. George was from that land, although to call him a Turkish saint would not be correct either since the Turks would not reside in modern-day Turkey until centuries after his death. St. George died in 303. The date of his birth is not known exactly, but it is generally thought to be somewhere around 275-281 A.D. That means St. George lived in Roman times. In fact, he was a Roman soldier in the Guard of the Emperor Dioceletian from Syria-Palaestinea. What about the story of his slaying the dragon? How is that possible when dragons are mythical? The dragon has long been associated with the pagan religions. Think of St. Patrick driving the snakes out of Ireland, which was a metaphor for driving out the druids or the old religion. Snakes, serpents, and dragons are fairly interchangeable as terms for pagan religions. You see, St. George was a Christian, but the Emperor Diocletian was one of Christianity’s greatest enemies, and he issued an order for all Christian soldiers in his army to be arrested and half to be put to death. St. George went to the emperor to protest, and being much respected by the emperor, Diocletian tried to get him to recant, but St. George refused. He was eventually put to death. His death as a martyr served as inspiration to others to convert. After all, the Christian Church is said to have been built on the blood of the martyrs. His suffering and death by decapitation are said to have so moved the empress and a pagan priest that they also converted and were put to death. The story of the dragon evolved from this event which is believed to be fairly historical. Exactly how a literal dragon entered the story is unknown, but the Crusaders brought the story of St. George and the Dragon back to Europe with them. In the tale, a maiden is offered to the dragon, but St. George rescues her and slays the dragon. The parallel to Perseus’ rescue of Andromeda is obvious. This story became so popular that St. George became the patron saint of England. He is a popular saint in several other countries besides England, including Portugal and Georgia (although it is not named for him), and of course, Turkey. In fact, he is one of the very few Christian saints who is venerated by the Muslims. 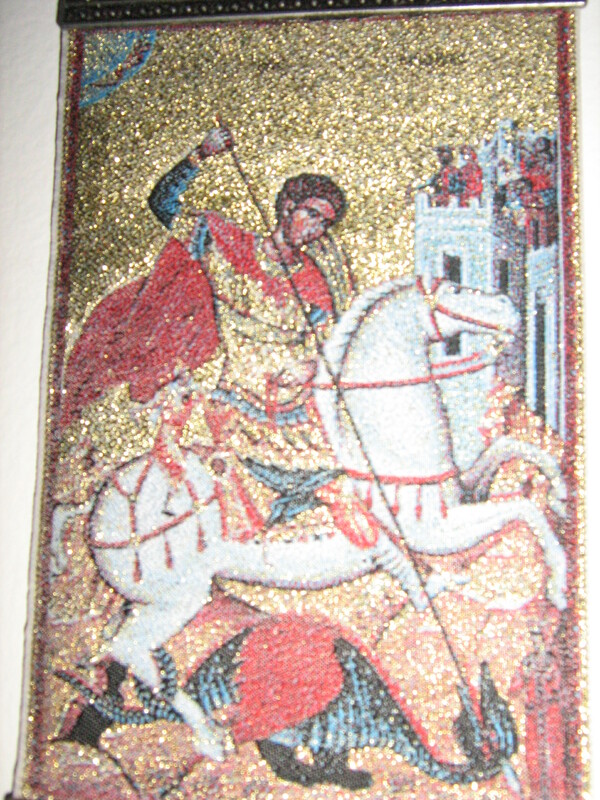 In Turkey, St. George remains very popular, although he is best known in Christian depictions in Byzantine Christian churches in Cappadocia (which claims to be his birthplace) that date to the Middle Ages and were carved out of the rock. I visited one such church while I was there, and I purchased the lovely icon pictured here in Ephesus at the Home of the Virgin Mary. 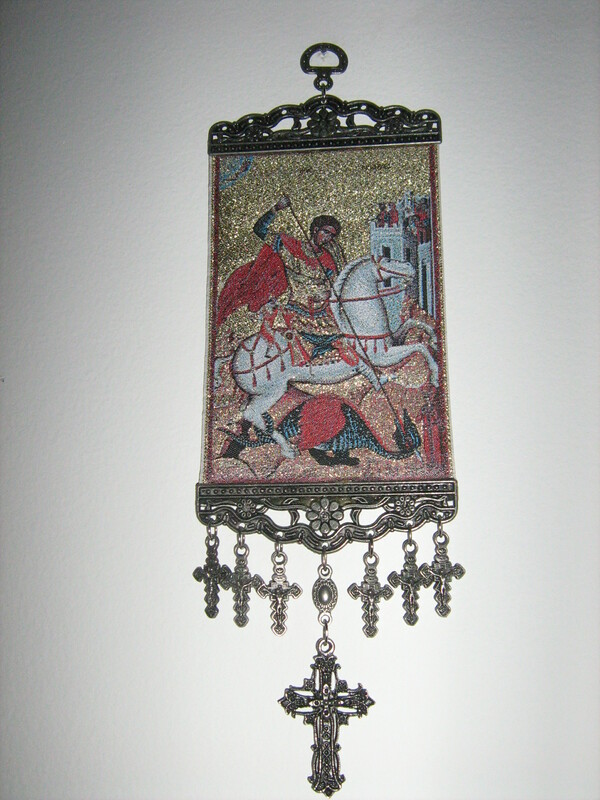 St. George is often depicted with a red cross and riding a white horse. In Edmund Spenser’s The Faerie Queene (1590-96), the Redcrosse Knighte is an idealized version of Christianity based primarily on St. George. More recently, he was depicted in the 1962 film The Magic Sword (also known as St. George and the Dragon, St. George and the Seven Curses). You have to be a real fan of cheesy older movies to sit through this film—I have but I wouldn’t again—but it’s interesting for how a saint can become such a myth and enter popular culture. And who’s to say that, on some mythical level, St. George and King Arthur do not ride together, guarding England, or should I say Britain? For Britain was not England in Arthur’s day any more than St. George would have known a place named Turkey. The story of St. George, be it myth or history or a little of both, will live on for years to come. I encourage you to investigate it more. Thanks Christie. I bit off topic from Arthuriana but still an interesting history.